Over the years I have painted lots of furniture and painting tables and chairs are by far the hardest furniture pieces to work on, especially chairs. 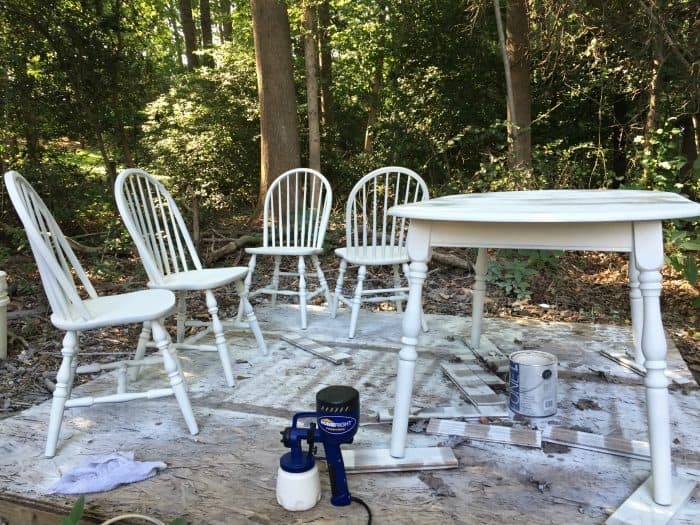 I spray painted my entire dining set a few years ago with cans of paint. It looks beautiful but it was slow go. I do love spray paint from a can but thought you should know it is a time consuming process. 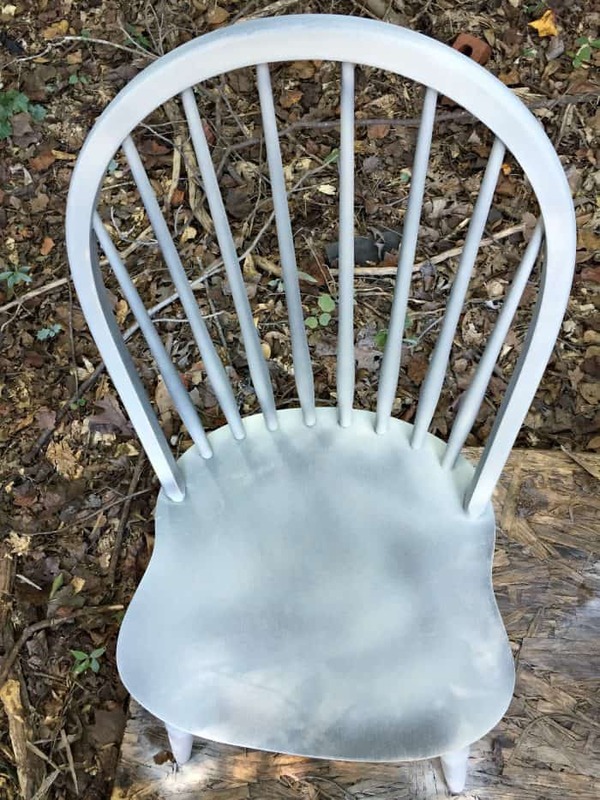 I’ve had lots of spray paint practice so I am pretty good at getting an even consistency but you can mess up fast if you aren’t very careful. 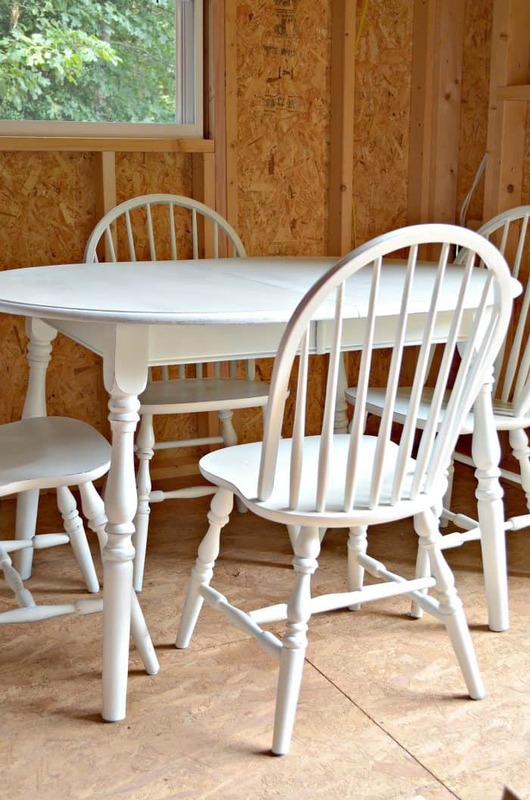 I’ve had this extra table and chairs in my attic for years now because it needed painting. It was the first table we bought when we were married and I felt a sentimental need to keep it. Plus, new furniture is super expensive and I was pretty sure I could use it again eventually. I painted this piece years ago with a paint brush when my kids were very small and it had been through the ringer. 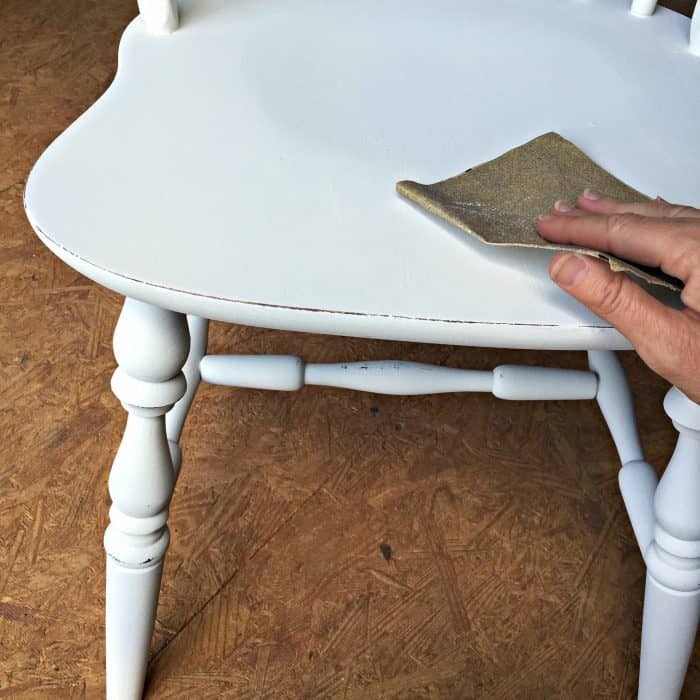 To get started on the furniture makeover I recommend you clean well and sand. I didn’t prime because I was starting with a painted surface that did not have poly on it. If you are unsure about your surface then prime first. 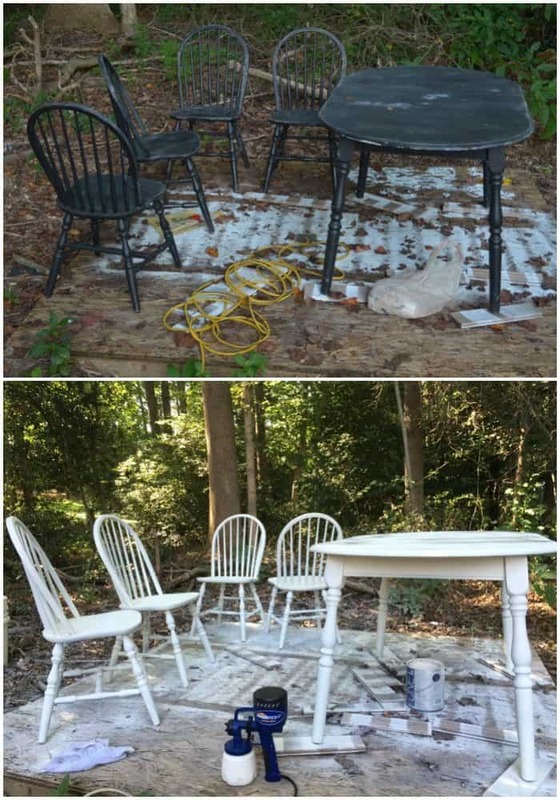 I knew this time around I needed a paint sprayer to paint this table and chairs. Something that would be more efficient than paint from a can. I had heard so many great things from a couple of blogging friends about the HomeRight Finish Max and I knew I needed to try it. 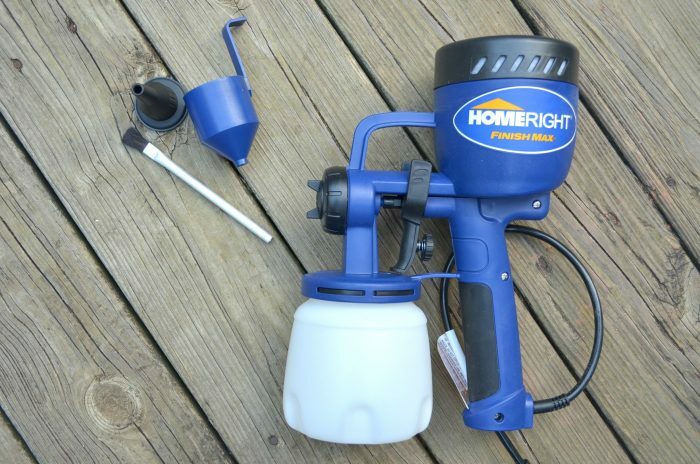 HomeRight was kind enough to send me the sprayer to test out. I took my table and chairs out to the back yard for painting. I cleaned them really well with Krud Kutter. Be sure you wipe off the cleaner well so there is no residue left behind. Next I went over the table top and seats with sand paper to smooth any imperfections. After that, I started spraying. The HomeRight finish max covered so fast. This is what one coat of paint looked like over black. Most of the table and chairs was covered with 2 coats of paint but I went back over with a 3rd coat to make sure none of the black was showing through. 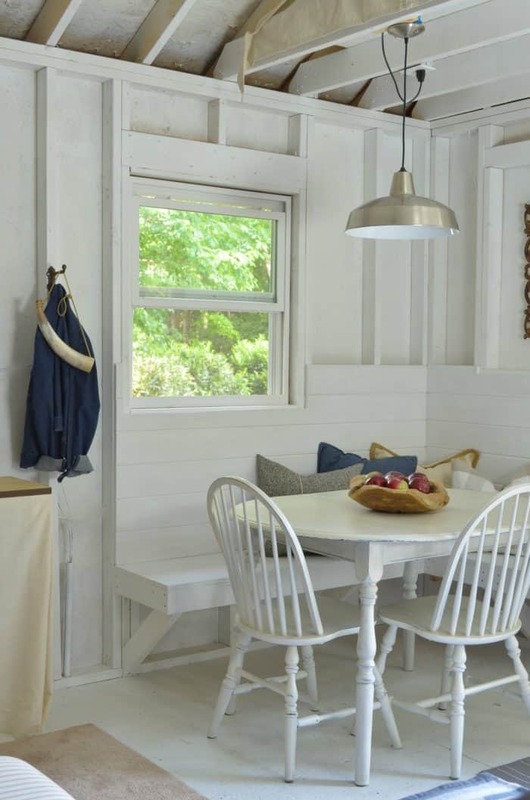 MAKE SURE you allow each coat of paint to dry before paint the next coat on. If your paint gets too thick because you are layering on too much wet paint it will take longer to cure and can peel and/or scratch easier. One thing I always tell people…it is a painted surface and there is always the chance it will scratch. I try to take as many precautions as possible to prevent unwanted markings but in the end it is still a possibility. I did want my table distressed so after I finished painting I used sand paper to achieve the look. For a more natural distressed look sand along the edges that would naturally get brushed against the most. The reason I recommend polycrylic is because it’s water based and it will not turn yellow over time, polyurethane will. Especially since I used a shade of white paint this is important. I looks great now in the shed out back that we have turned into an entertaining area. You can see how that shed makeover started here. 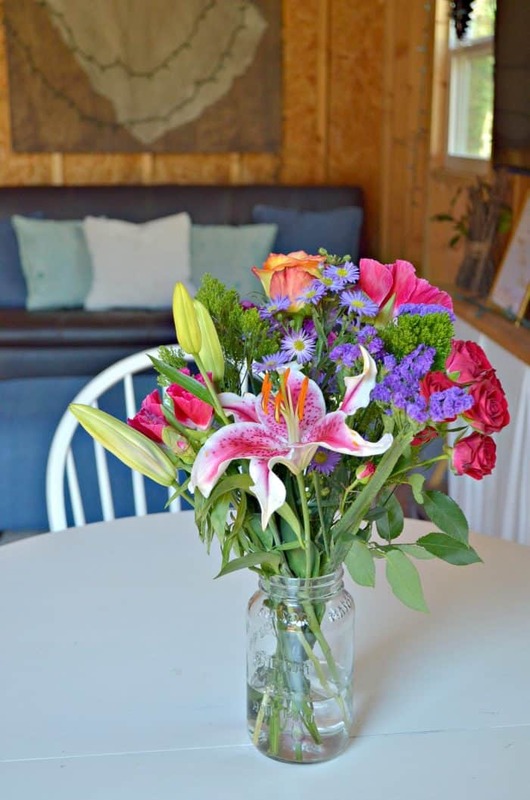 We recently hosted our daughter’s Sweet 16th birthday party out in the shed and the table really came in handy. UPDATE: The Shed Makeover is Complete! Painted dining table apron and legs with latex paint and then used a dark wax to antique. 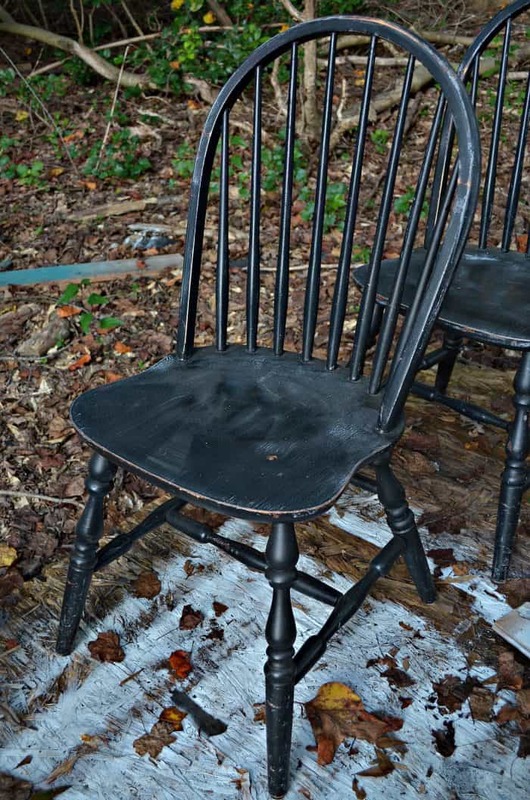 Have painted chairs with same latex paint and want to antique but also use a protective finish to protect from shoes. Do you suggest using a glaze over the latex and then applying polycrylic OR visa versa? Could I use a polyurethane with glaze? Thanks so much. Honestly I don’t usually use poly on my projects. 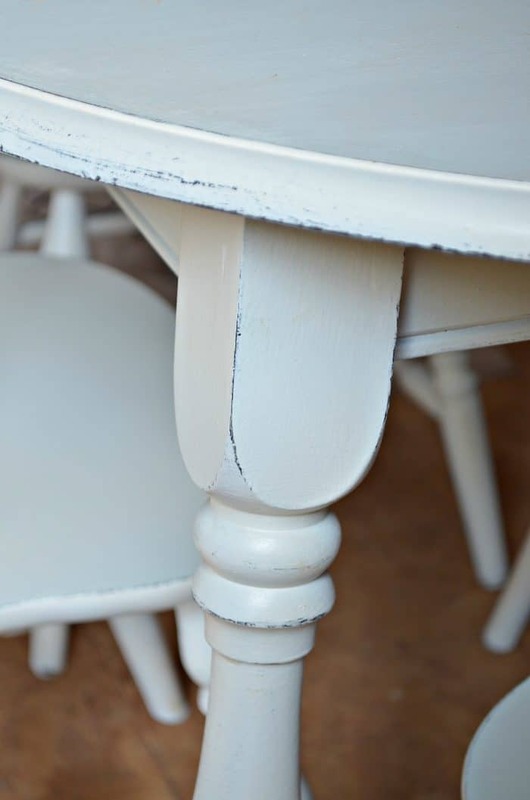 I’m satisfied to either use wax, if I have used chalk paint. Otherwise latex paint cures hard and so does glaze. That doesn’t mean they will stay perfect but poly makes it much harder to do something different later. I like the option. Polyurethane yellows over time so keep that in mind.